Russia 2018: Is Volgograd Arena cracking already? After the first test game in Volgograd a nationwide scandal broke out in Russia. How can a new stadium be cracking already? Well, it can, as the contractor assures about its safety. On April 23 the very first game at Volgograd Arena was held. Not the official celebratory one yet, but the crucial first test with most of the auditorium open to spectators. During two more upcoming games, on May 2 and 9, it should be ready to accept a sell-out crowd. While the interest in first tour of the stadium was very high, not everyone left the stadium satisfied. 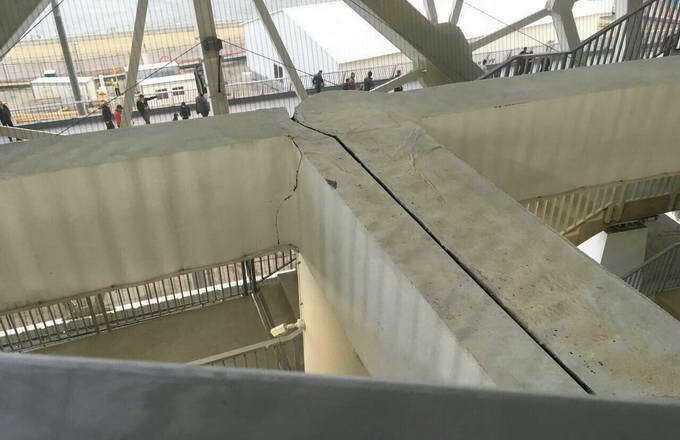 The below image (apologies, we weren't able to identify the author) began circulating around the net, showing a very noticable crack in one of the primary concrete beams supporting the upper tier. Because the stadium was built on wetland area and previously there were reports of parts collapsing during construction, actual fear took over and the image made headlines first around Volgograd, then across Russia. As the scandal grew, general contractor Stroytransgaz was forced to take a stand. In a special statement, published by major media outlets, the company assures there is no risk to spectators safety, neither during the test-matches, the World Cup, nor in future use. The larger, long crevice is a structural joint meant to give the concrete structure some 'breathing space' and elasticity. 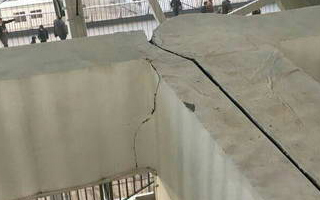 The smaller crack is only present on the finishing materials, not on the beam itself, according to assurances of Stroytransgaz.